On Wednesday, the Pope completed a six-day trip to Mexico by praying at the U.S.-Mexico border in the city of Ciudad Juarez. Before celebrating mass at a fairground, the Pontifex paid a visit to the border fence to pray for those who lost their lives on the perilous journey North, alongside a giant metal cross meant to commemorate them. In attendance were tens of thousands, many of whom crossed the border from El Paso, Texas to hear the Pope speak. During his homily, he called for those listening to have open hearts and recognize the exploitation that drives many to flee their homelands. "We cannot deny the humanitarian crisis" the pope stated, in reference to the thousands of migrants who "are being expelled by poverty and violence, drug trafficking and organized crime". The city of Ciudad Juarez is a pivotal crossing for those trying to reach the United States, and has recently been plagued by drug and migration-related violence. The pope offered words of inspiration to youth to avoid drug trafficking, and took a swipe at Mexico's powerful and corrupt: "the flow of capital cannot decide the flow of people". This past Monday, long-awaited relief finally came to Madaya, a remote Syrian town on the outskirts of Damascus where more than two dozen people have starved in the past two weeks as a result of humanitarian blocking from pro-government forces. The last time Madaya received any form of aid was October 18, driving residents into such desperation that many have been trying to survive off of grass, leaves, and boiled water. Madaya has garnered an immense international response, with many prominent figures speaking out about the state of horror there. UN Secratary-General Ban Ki-Moon on Thursday called the use of starvation as a weapon a "war crime", and relayed reports from UN teams that the residents of Madaya were "little more than skin and bones: gaunt, severely malnourished, so weak they could barely walk"
We are witnessing a human rights crisis as Europe goes through its largest migration influx since World War II. Between January and August, more than 350,000 people have fled their home countries to seek safety and opportunity in Europe. Many of these migrants are from Syria and neighboring countries devastated by civil wars and the violent spread of the self-proclaimed Islamic State. Migrating to safety has been extremely dangerous for thousands of people. In 2015, more than 2,600 individuals have died crossing the Mediterranean en route to countries like Italy and Greece. Each day brings another report of deaths—100 people confirmed dead in a boat off the Libyan coast, 71 people found after suffocating in a truck in Austria, and many more thousands whose stories never make international headlines. Those who reach Europe face growing anti-immigrant violence and border security forces designed to keep each new group of migrants at bay. As a human rights advocate working with migration on the US-Mexico border, I have watched the situation in Europe unfold with anger and sadness, but also with a sense of deep familiarity. There are parallels in the reasons people migrate and the tenacity with which they fight for a better future. But sadly, there are also similarities in the kinds of xenophobic and reactionary rhetoric that are forcing migrants into danger. The statement by the White House is not only hypocritical but also harmful. It ignores the nearly two decade-old human rights crisis on the US-Mexico border and perpetuates two harmful beliefs that blind us to the real problems at hand in both these contexts. First, the White House mimics many American politicians in using traffickers as scapegoats for all the dangers that migrants face. Human smuggling is a clear policy issue, but it does not begin to address the full scope of violence suffered by people migrating to the US and Europe. Rather, scapegoating denies state culpability in the deaths of migrants and diverts attention away from the reality that most violence suffered during migration is structural—a direct consequence of policy designed, executed, and enforced by the state. The White House, and indeed much of the American commentary on this issue, has funneled the blame to traffickers rather than more accurately focusing on continued policies that put people in the dangerous position of needing a smuggler to migrate. The White House’s statement also committed the same error that many American officials do when discussing human rights—it frames human rights, and human rights violations, as a problem that only exists outside of the context of the U.S. This relieves us of any responsibility to uphold those same values within our borders. While the White House advocates the protection of migrants’ human rights in Europe, it disregards the human rights violations that occur daily on the US-Mexico border as thousands of migrants die and disappear in the remote and harsh border terrain. Thus, before we can begin to comment on the migration situation in Europe, or anywhere else, we must look inward at our own refusal to adequately, consistently, and humanely address the suffering on the US-Mexico border. Activists in both the US and European contexts are fighting for a future where migration is no longer an act shrouded in danger, where international policies are designed to protect lives, not risk them, and where we can justifiably stand for human rights without the stink of hypocrisy. We cannot create this future if hubs of government power like the White House refuse to openly acknowledge our own failure to protect the human rights of migrants. For more from the Colibri Center for Human Rights, click here. 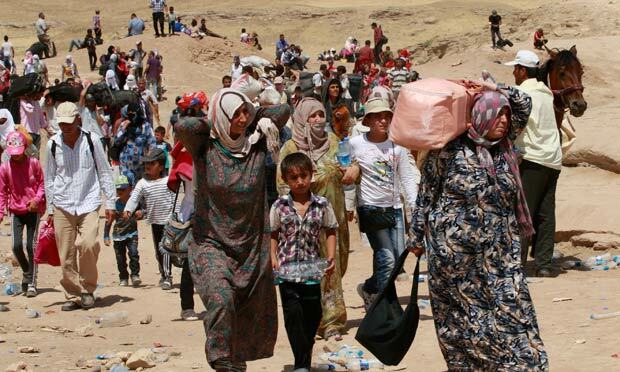 Syria: This week we highlighted some of the ongoing problems facing Syrian refugees. With the war in Syria entering its fifth year, millions of displaced people continue to suffer from a lack of humanitarian aid. International President of Médecins Sans Frontières, Joanne Liu, describes how her organization faces a series of political and social obstacles in providing medical services to the region. In addition to facing physical threats, Syrians are also in danger of losing part of their cultural heritage. With ISIS and other military forces continuing to operate in Syria, fighting has led to a transnational effort to protect cultural and historical artifacts that lie within the combat zone. Outside of Syria, the country’s neighbors also face numerous obstacles due to the massive influx of refugees requiring assistance within their borders. As the war drags on, deeper issues outside of meeting basic living standards have arisen. With much of the adult Syrian men back at home, a large proportion of refugees are women and children. As a vulnerable population group, they have been subject to numerous challenges including forced prostitution, child labor, and religious persecution. In Turkey, for example, only 1/3 of Syrian youth are receiving a formal education – raising fears of a poorly educated generation entering the labor market. Unless there are some radical new developments the situation will only get worse since the total number of Syrians forced out of their country could exceed 5 million by the end of the year (from roughly 4 million now). Unaccompanied Children - Pressing obstacles and issues still exist for minors around the globe – specifically youth who have been separated from their families. In the US, research has indicated that some states are far more likely to deport unaccompanied minor migrants who have entered the country than others (i.e. 30% in Georgia vs. 9% in Florida). These differences in court processing present an interesting situation regarding federal oversight of state policies. In cases where migrant youth have obtained legal status there have already been successful stories of their acclimation into American society. Globally, hundreds of fleeing minors have perished during treks across the Mediterranean, facing deceitful traffickers, extortionists, and the ferocity of the high seas. This week, the UN announced proposals for actions European nations should take to address their migration crises, including meeting the needs of unaccompanied children. Organizations such as Save the Children have already been mandated by respective governments to provide services to youth that land on European shores. International Women's Day- This past week celebrated International Women’s Day, with Restoring Family Links giving a special shout out to current and former female activists. This week, a group of women announced plans to walk across the demilitarization zone between the Koreas in a call for peace and “to help unite Korean families tragically separated by an artificial man-made division.” In addition, we highlighted the ongoing sociopolitical struggle in much of South East Asia – Burma in particular – where Zin Mar Aung, a female rights activist who has spent 11 years in prison for protesting government policies, continues to promote democracy and increased female agency within the region. We also honored Clara Barton, a powerful social agent and founder of the American Red Cross in her quest to alleviate human suffering and promote principles that affirm the intrinsic value of every person within society. The final part of our coverage of the migration conference features a panel discussion on missing migrants, the closing keynote presentation by photojournalist Encarni Pindado, and final remarks made by American Red Cross Restoring Family Links Caseworker, Nadia Kalinchuk. The panel on missing migrants highlights the work of organizations and individuals to find and identify missing migrants and support the families of the missing in Guatemala, Honduras, and along the US-Mexico border. The discussion highlights both the difficulty and the importance of this work - especially when looking at the issue from a "Restoring Family Links" perspective as many families have gone months, years, and even decades without knowing the fate of their loved ones. While the dedication and work of these and many other organizations and volunteer groups helps find and identify many missing migrants, the panel highlights the policy changes needed across the region to avert this humanitarian crisis and bring justice and closure to families of the missing. The panel includes Fredy Peccerelli from Fundacion de Antropologia Forense de Guatemala, Robin Reineke from Colibri Center, Adrienne Pine from American University, and Robert Conrad from the American Red Cross. The closing keynote presentation by Encarni Pindado focused on her work as a photojournalist, documenting the lives and journeys of migrants in Mexico. Her latest project, Migrazoom, provided cameras and training to migrants, who then documented their own stories through photography. The photo essays are a moving depiction of the protection needs of migrants. The final remarks made by Nadia Kalinchuk highlighted the importance of all the work being done by the represented organizations and individuals.